Nothing beats a stir-fry for weeknight meal simplicity. 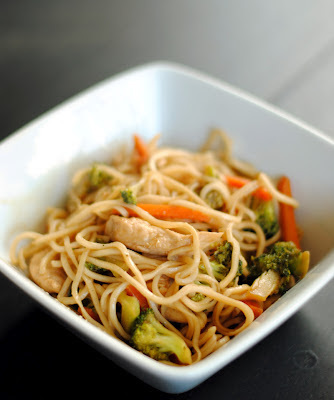 And chow mein is a comfort classic around here. It's so easy to whip together, and a great way to clear out neglected vegetables in the fridge. I used broccoli and carrots in this batch because we had a ton extra, but red peppers, celery, bean sprouts - really any other vegetable - blend perfectly. Feel free to switch up the meat, too, or leave it out completely for a vegetarian twist. In a small bowl, combine soy sauce, oyster sauce, hoisin sauce, sugar, sesame oil, and water. Set aside. Boil noodles according to directions (mine just need to boil for one minute) and rinse with cool water. Set aside. Heat wok on medium heat, and add a couple tbsp of oil. When heated, saute the onion and garlic until fragrant. Add the veggies, and cook until slightly tender (about 5 minutes around here). Add a few tbsp of the sauce to the wok, turn up the heat, and add in the chicken. Cook until it reaches 160F, or runs clear when pierced with a fork. Everything should be nicely mixing together. Finally, add the noodles and the rest of the sauce to the wok mix, and combine. That's all there is, there isn't any more. Easy, eh?